The scene near the mouth of the Lachlan Rivulet at Tynwald Park. 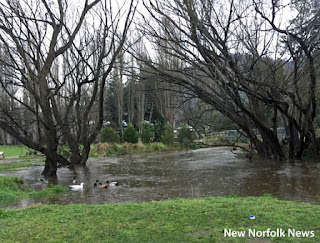 PARTS of New Norfolk and surrounding areas are tonight experiencing minor flooding around the River Derwent and its tributaries following rain and a bigger than usual high tide this afternoon. There is a road weather alert for for many parts of Tasmania including the Upper Derwent Valley. Icy roads during Friday morning, and snow covered roads above 300 metres throughout Friday, will make driving conditions dangerous during Friday in parts of the North West Coast, Central North, North East, Western, Central Plateau, Midlands, East Coast, Upper Derwent Valley and South East forecast districts. For information on any road closures, contact your local council or the Police. The next alert will be issued by 11pm.